This gallery features tan bedroom ideas in an assortment of design styles. Using a tan color theme in a bedroom is a popular choice that can create a harmonious and relaxing space you’ll love. Below you’ll find ideas for using tan decor, furniture, matching colors and accents. In the image above this master’s suite features how different wood tone finishes, fabric textures and accent colors can be used to achieve a traditional yet sophisticated design scheme. Tan walls in satin finish with marbled effect using the ‘smooshing technique’ gives this bedroom an elegant look. Incorporating different wood tone finish for the furniture and cornice, creates a very warm feel. The upholstered armchairs and ottoman which combines different fabric textures and accent colors such as velvet, brocades, suede and silk generate a welcoming ambiance. The character, quality and the ambiance of any room weighs heavily in the color scheme used. One of the popular choice of inspiration for a timeless bedroom is the soothing scheme of neutrals and among the favorite is the color tan. As a neutral color, tan is an exceptional color used commonly as backdrop or background in most bedroom design. When combined with accent colors, it can take on a cool or warm tone. These combinations create sophisticated color scheme and layouts. Tan by itself is perceived at time as a dull color and has a minimal effect when used in a monochromatic scheme. Tan color is usually associated with feeling of piety and being conservative. Tan’s base color is made up of not in equal proportions of the three primary colors – red, blue and yellow and combined with the color white. Here are some tan bedroom ideas with emphasis on color and decor to help you see the color tan in a different perspective. A light tan, beige, buff and cream is achieved by using extra white to the mixture. When used as a background color, feel young and fresh by combining it with bright primary and secondary colors such as red, blue, yellow, green, orange and violet. It can give out a feeling of refined elegance to the design. Adding more yellow creates yellowish tan or golden tan such as camel, tawny and khaki color. These background colors combined with accents such as orange and brown creates a warm ambiance to any space. Grayish tan such as taupe and dun is crated by altering the balance of the base colors and having blue as the more dominant color in the mixture. These colors are often used as a concrete or stone texture backdrop combined with color accents which reflects a traditional feel to the overall design scheme. More red creates a shade of tan, more known as the colors ginger, amber and copper. These colors are warm colors which when combined with neutral colors resonates warmth and a welcoming feel which stimulates a sense of security and serenity. The following bedroom design ideas shows you how to use different materials such as wood and leather; and how it can be combined with different textures and finishes in order to achieve a perfect ambiance for a bedroom. 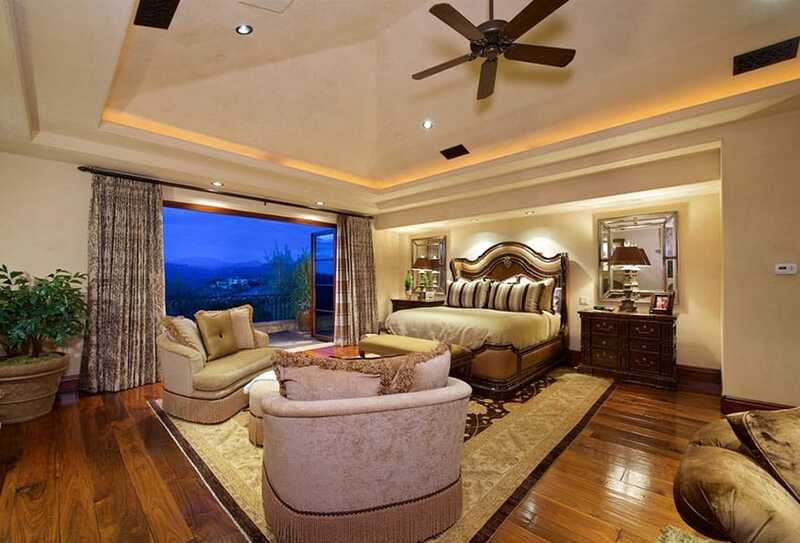 An outdoor balcony with a grand view is a perfect match for this luxurious master’s bedroom. Light yellowish tan is used for the walls in order not to over-power the view outside. 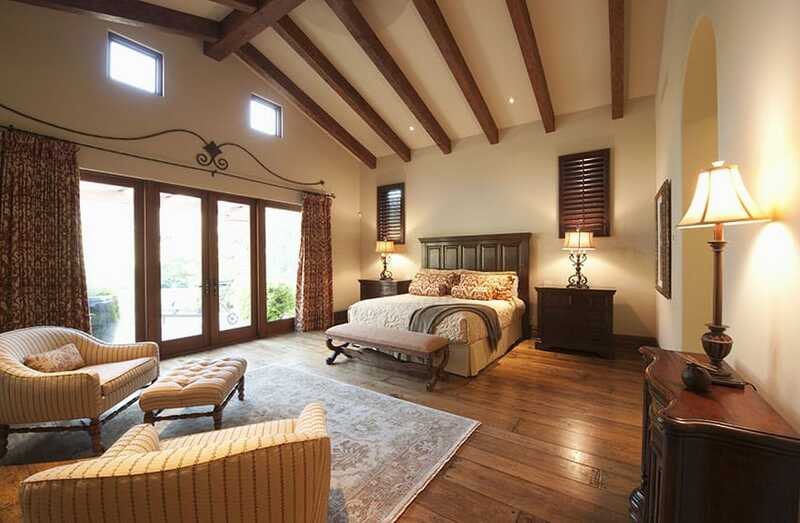 The medium tone hardwood floor and cove ceiling creates serenity and timeless elegance. Massive furniture with different upholstery materials is used in order to achieve a warm design effect. Be inspired with this master’s bedroom complete with classic white plantation window shutters which provide superior light control and a much-needed privacy. Tan walls in matte finish create a perfect background for an elegant color scheme combined with dark tone wood finish for the furniture, beige floor carpet, peanut shade satin duvet and pillow cases, accented by grayish tan throw pillows. Green plants add a tranquil feeling to the bedroom ambiance. 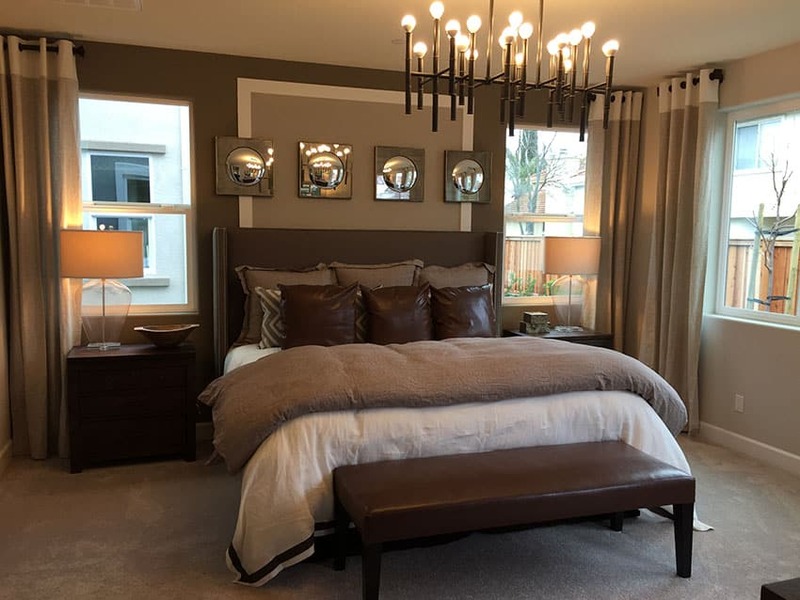 This chic and trendy master bedroom suite features a dark mocha tan accent wall highlighted with such sophisticated wall accessories and combined with a light beige wall. The neutral two-tone, floor length panel curtains blends in well and give this bedroom a dignified formal look. The ceiling is painted with an eggshell finish in off-white color. Modern ceiling lighting fixture and stylish night lamps gives this bedroom’s ambiance more drama. A splash of brown leather for accents and dark brown wood finish for the furniture adds warmth and coziness. High vaulted ceiling and exposed beams are very traditional of a Tuscan inspired bedroom design with a tan color matte finish and medium tone hardwood floors. The wooden furniture in medium tone varnish, patterned curtains and pillow cases, iron curtain rod design, bedding, lounge chairs, tufted ottoman, traditional iron lamps and area rug make the space feel consistent with the chosen theme. This masculine yet cozy master’s bedroom suite uses a khaki shade of tan combined with a medium tone semi-gloss wood varnish. Light cream color for the ceiling and floor allows the eyes to focus on the elegant furniture and accessories. 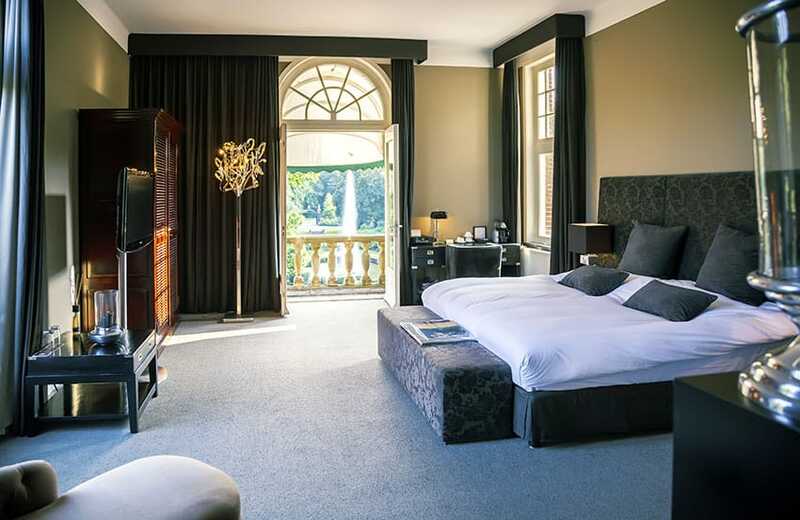 Large picture windows are incorporated with linen curtains in neutral tone are tailored to allow moderate light while still providing much needed privacy. Exposed beams in light natural finish adds drama to the room without over-powering the whole design theme. A luxurious master bedroom featuring an elaborate cove ceiling design, large windows, traditional four-post bed, furniture in medium brown tone finish, a seating area and the fireplace adds elegance to this grand master suite. Silver and metallic accessories and a few furniture pieces are very classy add-on to the design concept. Using white for the ceiling, beige carpet flooring and light tan walls with a slightly darker tone of tan for the accent wall as the main backdrop gives this bedroom a neutral, warm, clean and subtle feel. This rustic yet cozy family bedroom features a sleeping quarters for kids and a private space for Mom and Dad. Inspired by the US Flag, red, white and blue accent colors blend perfectly with the sandy tan backdrop for the walls. 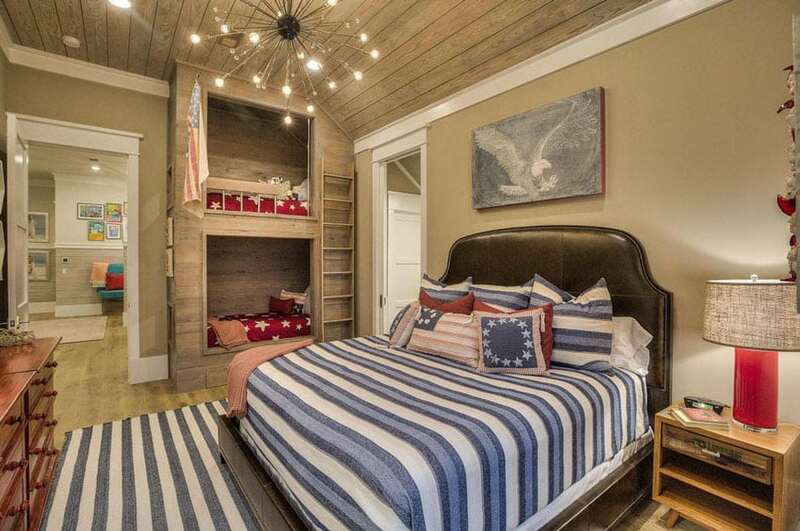 The grayish tan wood stain for the ceiling, flooring and the kids’ sleeping quarters combined with the dark tone leather headboard, white cornice, baseboard and door trim balances the whole design theme. Mediterranean style is one of the most popular interior decorating styles. This rustic décor features a vaulted ceiling with massive exposed beams, neutral color palette combined with a stone fireplace, traditional furniture, cast iron lighting fixtures and accessories creates a luxurious and comfortable ambiance. Light yellowish tan walls and light beige carpet flooring are perfect backdrop capturing an image of a relaxing Mediterranean retreat. Inspired by the Mediterranean style, this master’s bedroom is a fusion of the best elements which captures the romantic beauty of the region. The round exposed beams, dark wood finish of the furniture, dark leather upholstery and unique accessories all contributes to achieve a perfect theme for this stylish bedroom. By using tan as the main background color for the walls and carpet flooring, encapsulates the images of a tranquil seaside retreat. Tan bedroom ideas with an orange tint can convey a feeling of warmth and elegance. 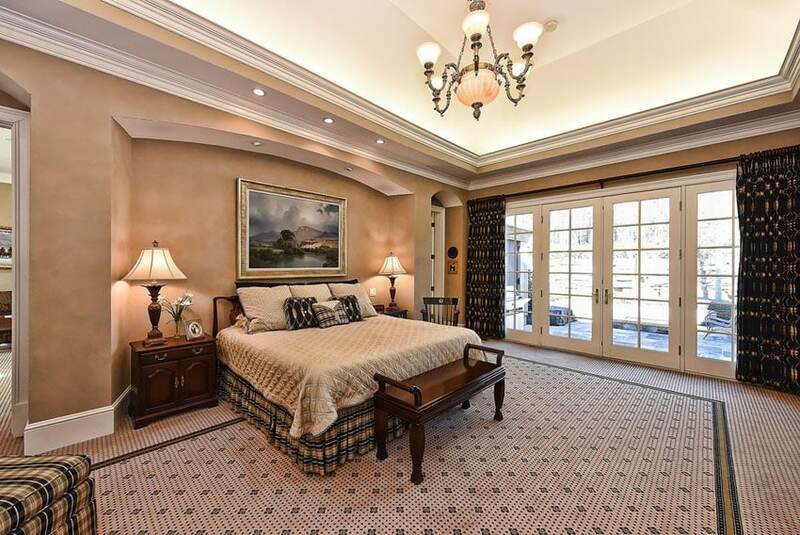 This traditional and luxurious master’s bedroom features an alcove wall and a tray ceiling design combined with an elegant chandelier and night lamps, gives this bedroom a stylish and romantic ambiance. Marbled tan walls create a perfect backdrop which brings forward the playful textile prints and plaids, carpet design and dark wood tone finish. Be inspired with this charming master’s suite complete with a very cozy seating area. Tawny beige walls, cream carpet flooring, dark wood tone furniture combined with different shades of brown and pastel colors gives this bedroom a tranquil and restful ambiance. The bedroom is designed with a high cove ceiling to incorporate the large picture windows which allows ample lighting and brings in the beautiful outdoor scenery inside. An inspiration for a timeless romantic master bedroom featuring a neutral color scheme, custom designed panel bed frame in grayish tan finish, custom color wood varnish, tray ceiling design, traditional chandelier, and metallic accessories which carries a fascinating composition of design. A contemporary style black and tan bedroom features a brocade fabric upholstered headboard and footstool, floor panel velvet curtain and mixed with modern accessories and furniture all create drama and flair to this elegant well-designed master’s suite. Decorating with the neutral color tan is anything but dull. The soft hues of tan create a calming atmosphere to this stylish master bedroom suite. The decorative tray ceiling coffered design extends to the taupe accent wall pattern and bed frame shape. The wall treatment is carried through the large panel windows and into the entertainment area. Modern lighting fixtures, area rug and accent furniture pieces adds personality to the room. A whimsical master bedroom suite in neutral khaki tan color features a recessed ceiling, four-poster bed, a seating lounge and a custom-built storage cabinet in light wood tone stain finish. Deep purple suede upholstery and printed curtain valance are used for accent pieces. A traditional bedroom with a serene palette of camel tan color, highlights an elegant and comfortable seating lounge, writing area, coffered ceiling with cupola, medium tone hardwood floors, classic armoire and a king size bed with an intricate headboard design in such refined stain finish. A timeless design style that always has a cozy and a welcoming feel. This Mediterranean inspired master’s bedroom has a relaxed, neutral backdrop with a vibrant, earthly shades for accent colors. 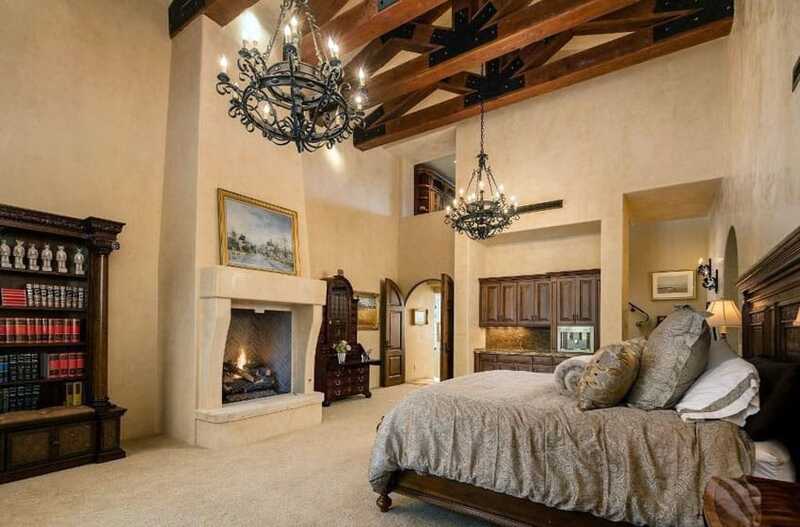 As typical to the Mediterranean design style, this bedroom has vaulted ceiling with exposed beams, stone fireplace, dark tone hardwood floors, rustic accessories and lighting fixtures all contribute to a luxurious design style. Plastered textured wall in grayish tan color gives a warm Mediterranean visual appeal to this master bedroom. Rustic wooden furniture and accessories, arched windows and vaulted ceiling equally plays important pieces which shapes the Mediterranean style motif. Inspired by the transitional design concept, this master’s bedroom complement both the traditional and the contemporary style which create harmony and balance to the design concept. The furniture pieces in a neutral dark tone wood finish, crystal chandelier and night lamps adds elegance to this bedroom. A relaxing transitional master’s bedroom design theme which highlights a rich yellowish tan printed wall paper, large picture window, four-poster bed and a wing back chair creating an inviting atmosphere. Deep red and purple accent color combined with dark tone wood finish and light beige carpet flooring are colors which brings influences of a luxurious and comfortable design styles. Many tan bedroom ideas incorporate white to brighten the space and keep it looking energized. 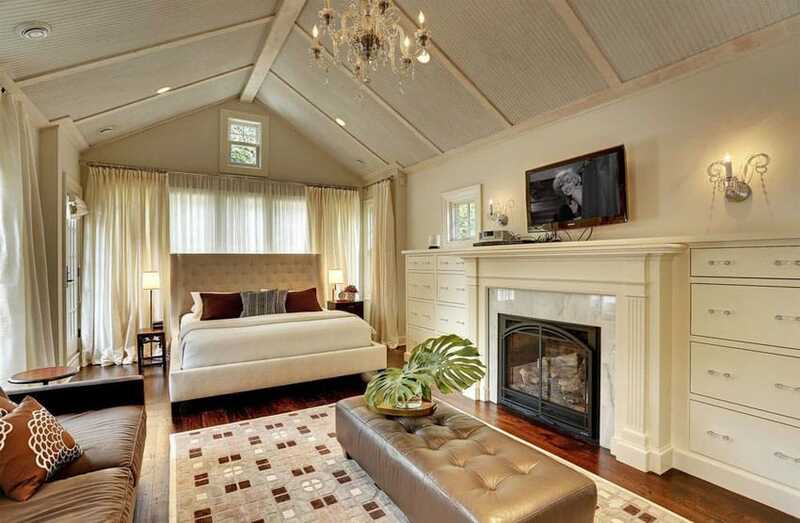 This chic and elegant tan and white master bedroom highlights a cove ceiling design, paneled walls, large picture windows, dark tone hardwood floors, geometric print area rug, cream color cabinets, metallic based night lamps, natural wicker headboard and different textured-textile for the bedding.